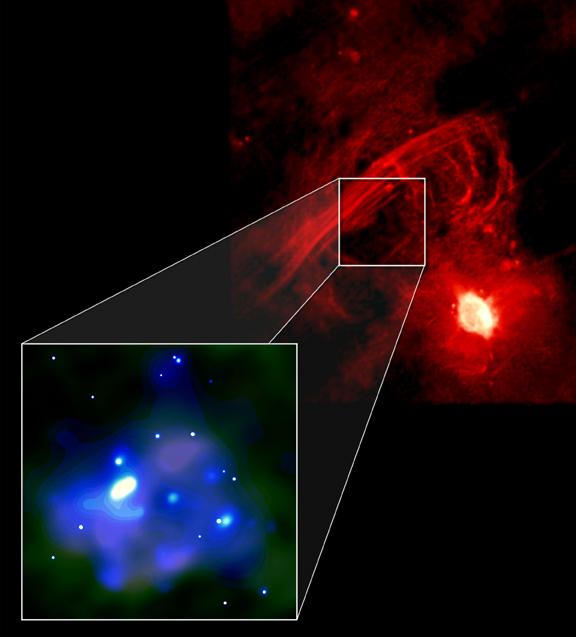 Credit: X-ray (blue): NASA/CXC/Northwestern/F.Zadeh et al. ; Millimeter Wavelength (green): Nobeyama/M.Tsuboi; Radio (red): NRAO/VLA F.Zadeh et al. Chandra observations of a region of the Galactic Center have found an X-ray filament and cloud about 40 light years across (blue). These X-ray features are associated with a huge cloud of cold gas (dark area in inset box) that is adjacent to large filamentary and shell-like structures that are bright sources of radio waves (red). The X-ray emission is thought to be produced when energetic electrons from the radio filaments collide with the cold gas cloud, which has a mass one million times the mass of the Sun. This process of the bombardment of cold gas clouds with energetic electrons could explain the origin of the mysterious X-ray ridge along the plane of the galaxy that was discovered nearly 30 years ago. 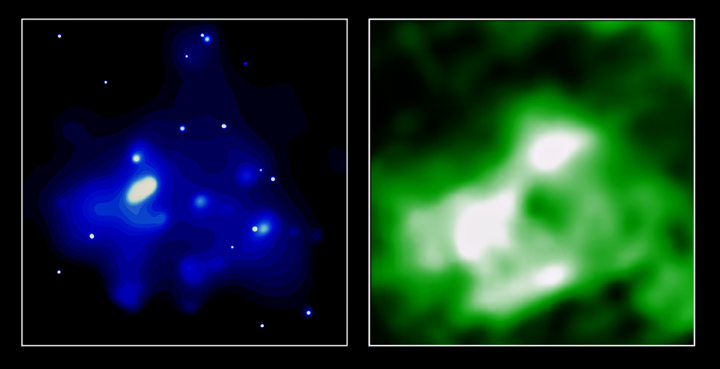 Credit X-ray (blue): NASA/CXC/Northwestern/F.Zadeh et al. ; Millimeter Wavelength (green): Nobeyama/M.Tsuboi; Radio (red): NRAO/VLA F.Zadeh et al. Scale X-ray/Molecular image is 8 x 7 arcmin. Radio image is 30 arcmin on a side. Coordinates (J2000) RA 17h 46m 20s | Dec -28° 52´ 00.01"